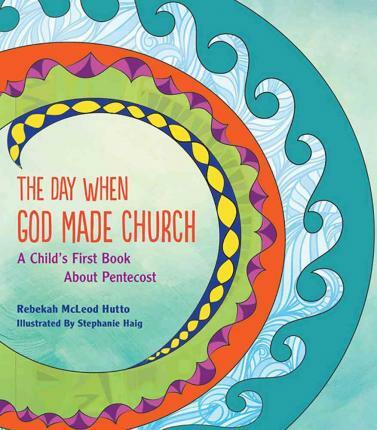 A wonderful book on Pentecost - with stunning illustrations and is a story for both young and old. This is a great one for your family library. Available on Book Depository and other Christian book retailers. Here are some dove and template flags for you to use in your pentecost activities - as prayers, parts of banners, or crafts. 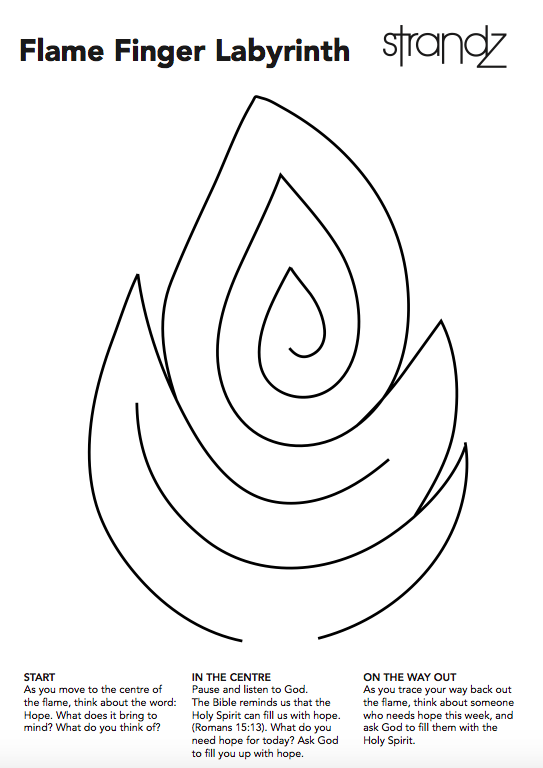 Dove Flame Template - where the dove can be rotated 90 degrees to be come a flame. The Presbyterian Church of Aotearoa New Zealand has put together Celebrating Pentecost, a resource full of activities and event ideas to celebrate Pentecost. even though we can't see the wind, it is still there; just like the Holy Spirit. Children can colour and decorate the pinwheel anyway they want. Make a small hole is made in the center, preferably with a hole punch. Holes are also punched on the four points where they meet in the center, and in the end of a plastic straw. 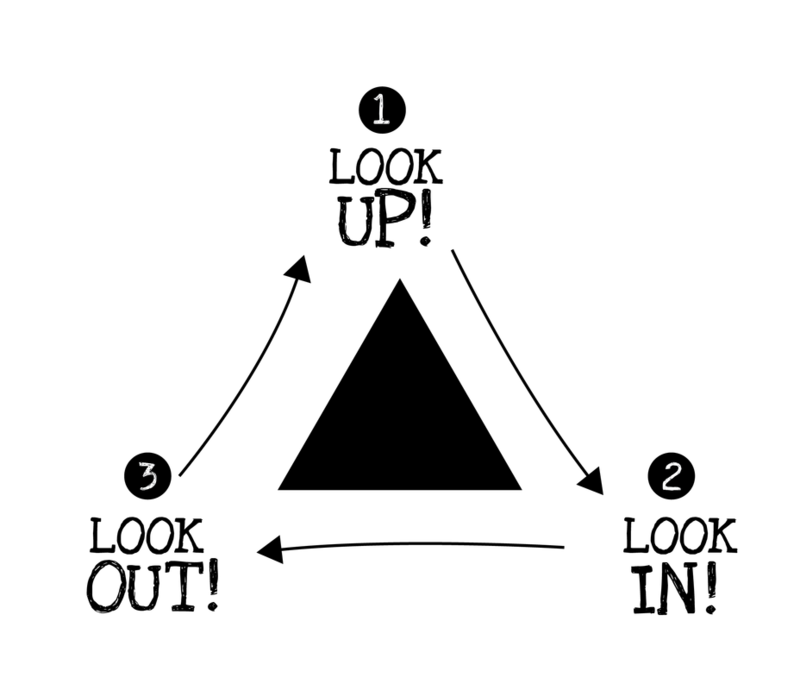 A paper fastener is weaved through all of holes and with the ends of the fastener opened in opposite directions. Once the pinwheel is made and attached to the straw, blow on it or have the children move around the room to see the pinwheel spin! Tell them to give or throw the roll to someone else, holding on to one end. Explain to the whole group that once they get a roll, they must pass it on to someone else, holding on to a bit of the streamer. Continue tossing or giving the rolls until they're finished. Some people might get rolls more than once depending on the size of the group. Explain that when they received the roll it was like someone was telling them about Jesus. When they passed it on, they were telling someone else. The Holy Spirit gives us the powerkeeps us all connected! Invite people to tear off a bit of the crepe paper to keep with them as a reminder of the Spirit and the power to share the Good News with others. Invite them to pull out the bit of paper later on in the week to share with someone else why they'd kept it. Pentecost Flames: Painting with Forks! Invite them to write a gift, talent or characteristic that they have starting with each letter of their name to form an acronym. Some children might need help. eg. Hang the banner fairly high and let the kids hang their raindrops under it. Pentecost spinners remind the children that sometimes things aren't seen, but they are working to move things along anyway. Just like the Holy Spirit, the air around us is hard to see, but we see the evidence of its work through the things it moves. Decorate both sides of the spinner. Make a 1 cm fold on both ends, folding one side towards the top and the other towards the back so that the folds sit perpendicular to the rest of the card. Now drop the spinner and watch it turn over and over! To demonstrate that even though wind and air are invisible, they can move things. Make a template of a spiral for each child by drawing a circle and spiralling inward. The spirals should be about 2-3 cms thick. The thicker the spirals, the better it hangs. Show the children how you can hold the dangling spiral above the flame (carefully) or lamp and it will twist because of the warm air rising. Look up, in and out! ​​Look up! God sent his Holy Spirit in a surprising and amazing way! Flickering fire, and people speaking in different languages! How would you have felt to be there, too? Look in! Jesus’ friends were together in the room. We don’t need to do this journey to Pentecost alone, either. God’s church is for everyone - all shapes, sizes, ages! Try and find a good faith-filled-friend to talk to about God. Look out! People in today’s story were confused by what was happening! Today, people may be confused about Christians, too. If your friends have questions about God or the church, ask​ God for the right words to talk with them. There are a whole bunch of amazing Pentecost resources on the Barnabas website with decorations, prayer resources and creative ideas. 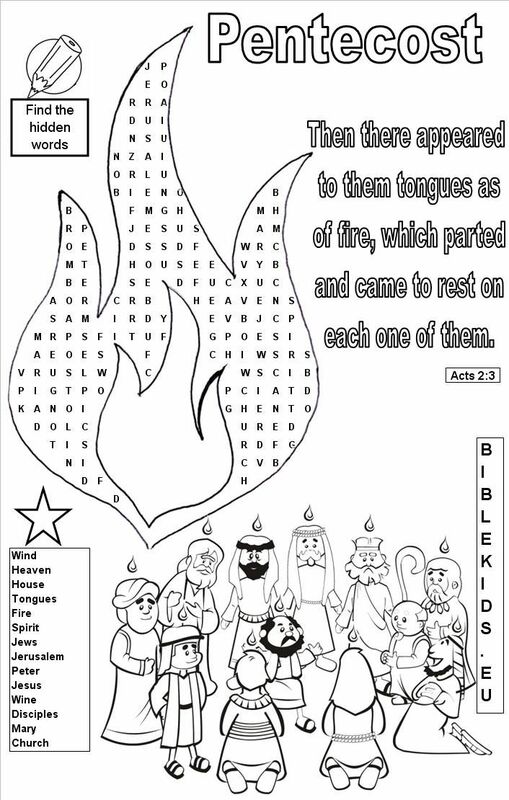 Through story, craft, game, and snack children will explore Acts 2:1-21 and learn about Pentecost, the birthday of the church, and the coming of the Holy Spirit. Story: To introduce the story of Pentecost to the children, you may want to share Acts 2:1-21 from the Bible or a children's bible- or better yet, tell the story briefly! Games: Play parachute games: Talk about how the Holy Spirit is like the wind. It holds us up and fills us up and makes us float. The Holy Spirit first came to the disciples like a rushing wind. “Spirit Says” -like Simon says…Spirit says wave the parachute fast, wave it slow, make it still, put it over your head, turn around and hold it, etc. “Tent Time” –everyone raises their arms up holding the parachute together, takes a few steps in toward the center, brings the parachute behind them, and sits down on the edge to make a mushroom, tent, dome, etc. “Ball Bounce” -use balloons and tennis balls on the parachute. You can try to keep them all on, try to bounce them all off, split into two sides and try to get the balloon off the other team's side, etc. “Switch Places” –number off the children, in 4's maybe? Raise up the parachute, call out a number or two, and those kids run under the parachute and switch places or find a new place. Snack: Birthday cake! Pentecost marked the first birthday of the church, so when we celebrate Pentecost, we celebrate the birthday of the church. Light trick candles, sing “Happy Birthday”, and talk about how the Holy Spirit is like a flame in our hearts that won't go out. It keeps us burning with love for Jesus. Eat and enjoy! 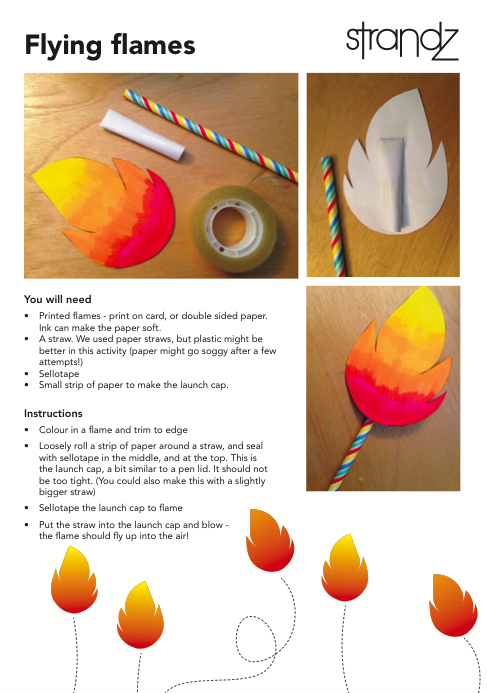 Craft: Wind tubes with streamers: Pentecost is when a rushing wind brought The Holy Spirit! The Holy Spirit is like the wind; we can't see it, but it's there. Sometimes, we can feel it though! Each child can make a tube out of a coloured piece of paper or light card. Before taping or stapling, decorate with stickers, foam, sequins, and markers. Glue/tape streamers to one end, and tape a piece of yarn to each side of the other end to make a handle. Let the kids move with their tubes so that the streamers fly out behind. 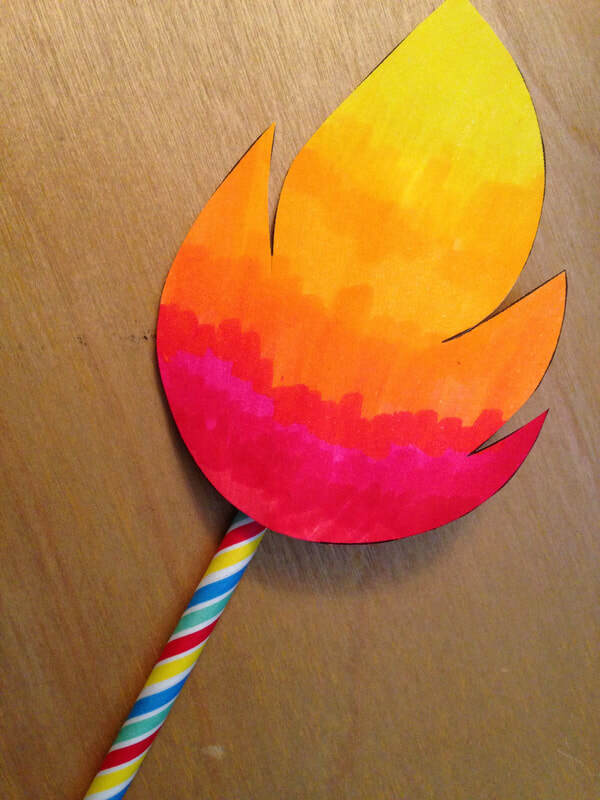 Use the flying flames activity to remember how God sent the Holy Spirit on the day of Pentecost. Pray that we would be filled with the Holy Spirit too, empowered to love and care for the world. dove/flame templates pre cut in red, orange and yellow (or in white if you want to allow people time to colour their birds). 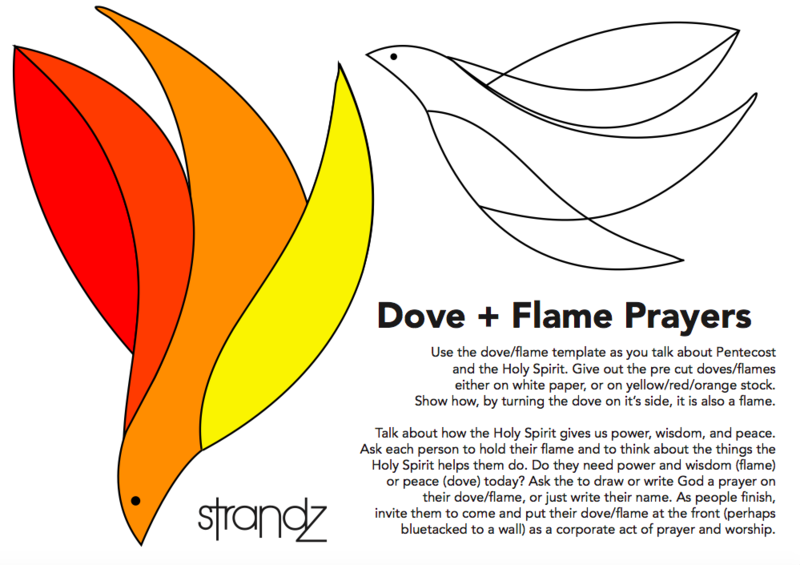 Use the dove/flame template as you talk about Pentecost and the Holy Spirit. Give out the pre cut doves/flames and demonstrate how, by turning the dove on it's side, it is also a flame. Talk about how the Holy Spirit gives us power, wisdom, etc. You can also talk about the fruit of the Spirit in our lives. Ask each person to hold their flame and in a moment of silence, think about their own lives and the things the Holy Spirit helps them do. Close this time in prayer, thanking God for the gift of His Holy Spirit. Then ask people to colour in their dove/flame and/or write something their thankful for. If people don't know what to write, they can draw a picture or even just write their name. Encourage adults and older children to help the younger ones. As people finish, invite them to come and put their flame/dove at the front, as a corporate act of prayer. You could make a board/poster, or just bluetac them to the wall or prominent place, to remind everyone of what the Holy Spirit does for us everyday.